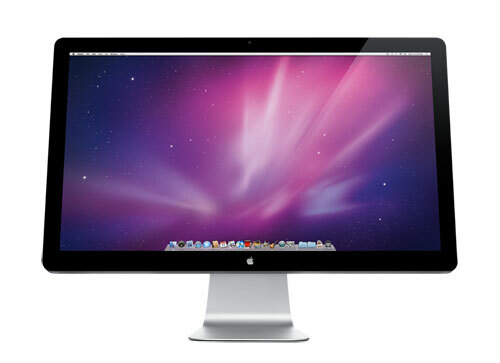 Apple has stayed stagnate when it came to updating their Cinema Displays.The original cinema displays were available in 3 different sizes, a 20”, 23” and a 30” inch display. These displays were fantastic and set up in many edit suites throughout the industry. However, recently Apple is being criticized for the lack of updated product for their Pro Users. The company’s direction seem more focused on creating mass marketed products such as the iPod, iPhone, and iPad. Does this new Cinema Display have what it takes to make pro users happy? First let me point out, in order to use these new displays you must have a mini display port, or and adapter for one. Upon first glance the screen looks very slick with it’s new glossy display. The second thing I noticed is my ability to comb my hair just looking at the display. Testing out a 27 inch display meant the screen was large, but also so was the glare which was enough to act like a full mirror. This can be mitigated if you work in a controlled environment, but if you plan on working with a laptop in the field somewhere, well then bring a comb and some hair gel. The display supports 16.7 million colors, and natively supports resolutions of 2560 x 1440 pixels, 1920 x 1080 pixels, 1280 x 720 pixels, with an aspect ratio of 16:9. This great news for editors as we can monitor HD footage in native format without scaling, unless you are editing RED files. The images look absolutely stunning and crisp on the display. Very impressive. This new display has some great new features. First of all you can remove the display from the base and attach a VESA mount for better viewing. There are 3 USB ports on the back, but no HDMI ports, which is disappointing as many of us have HDMI products that we would love to hook up to this screen including my own Canon 7D. The display also has a built in camera and speakers for those of you who use iChat. Another new feature is sound capability. Most of us use proper monitor audio speakers to get a full dynamic range of the audio, so this may not seem that great of a feature. However I was a little shocked at how the display performed with the audio. The sound was actually impressive coming from internal speakers. If you are cutting just plain stereo with no audio mixing, dare I say you could get away with working with the built in speakers. All of this sounds very impressive, but their are some downsides to this display. First of all the lack of widely supported inputs of DVI, VGA and even HDMI is frustrating, as you need an adapter to get you r other devices to work on it. This also includes older macs, unless you have the latest and the greatest. It also means you need an adapter for those of you with Kona cards myself included. This is can be the one feature that can drive some pro users away as Apple’s LED Displays. Many of the competitors have these inputs available at similar prices, such as the Dell Ultra Sharp U2711. Glare is another issue, but can be controlled. Color Grading may not be a good idea on this the glossy screen. An image graded on this screen will look completely different than on a Matte screen. There is no option for a matte screen. Just something to keep in mind. Apple has made a fantastic update to their Cinema Displays, and if you have no problems with some of the issues I pointed out, then this display is a true winner. However for me, the lack of inputs an no matte display is a deal breaker for me. Why Apple refuses to support industry wide inputs is beyond me. If you are in the same boat as I am, and are still looking for a display, check out the Dell Ultra Sharp U2711. It has inputs for HDMI, DVI with HDCP, VGA , Composite, Component , and a media card reader all built in, with very similar performance.